One of nature’s most incredible — and rarest — sights is coming to Oregon. On August 21, 2017, the state will be treated to a total solar eclipse, a rare celestial event in which the moon passes in front of the sun and completely blocks its light, briefly turning daytime into twilight. Mark your calendar now, because the next opportunity to view a total solar eclipse from Oregon won’t occur for nearly 100 years! And Corallis is directly in the the viewing path! Where can I experience it? Cities closest to the path of totality, such as Corvallis, have the best viewing opportunities. On August 21, 2017, the path of totality will begin in the remote Pacific Ocean north of Hawaii and first make landfall on the Oregon Coast, just north of Depoe Bay, at 10:15 a.m. From there the moon’s shadow will race east toward Salem. Thousands of people are expected to turn out to celebrate the roughly two-minute-long totality,. Continuing east, the shadow of the moon will pass over Madras Mitchell, John Day and Baker City. 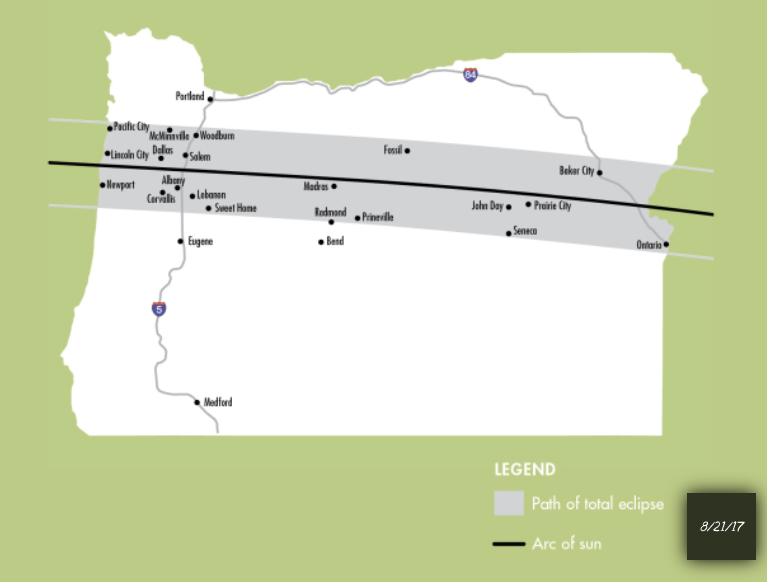 Due to the rapid movement of the moon around the Earth, the moon’s shadow will traverse the entire state of Oregon in only 12 minutes. Wait, will I go blind? A solar eclipse can be safely viewed by wearing eclipse glasses that block most visible light and all harmful ultraviolet light. These glasses should be worn whenever even a part of the sun can be seen; only during totality when the moon has slid fully in front of the sun is it safe to take off one’s eclipse glasses. In fact, observing those brief seconds of totality without eclipse glasses is encouraged because it’s possible during this time to see the outer atmosphere of the sun and its streamers, loops and plumes of gas. What about logistics: weather and traffic? Eclipse chasers from around the world are expected to descend upon Oregon in 2017. There’s the cachet of seeing an eclipse in the state where it first makes landfall, and meteorologists have also predicted that Oregon will have the best weather conditions anywhere along the path of totality.